Today we will celebrate our upcoming birthday by opening this new blog space we are calling "Share Your Voice". Here you'll be able to see news about SASS, interviews with artists, articles about social justice and our community, discussions about the pieces on recitals, and so much more. This is day 3 of our lead up to the celebration of SASS's 3rd birthday! Beyond creating this blog space, we will also share a piece with you that will be a binding element in our 18-19 season. As I was thinking on the season and deciding on the themes, I realized that we needed a way to unify the recitals and bring the whole season together to show that we are all one community. The inspiration for that came from former president Barack Obama. During his campaign for his second term as president, he delivered a speech that included the text, "One voice can change a room, and if it can change a room it can change a city, and if it can change a city it can change a state, and if it can change a state it can change a nation, and if it can change a nation it can change the world." 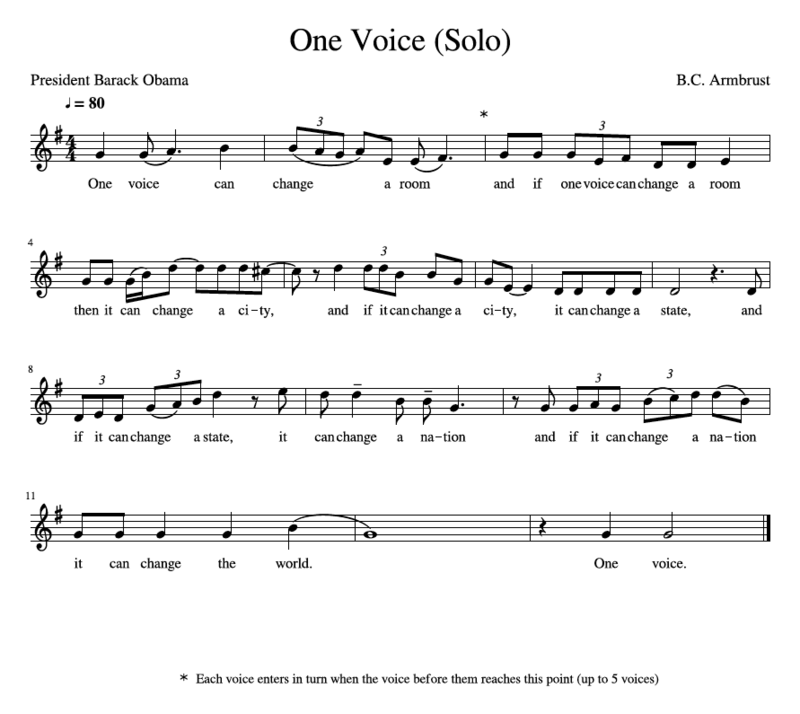 I took that speech and set it as a canon for 5 voices called "One Voice". It will be performed at each of the recitals in the season and at each performance we will include one performer from a previous recital so that by the end we have one voice representing each of the 5 recitals singing the canon together and showing how we are bound by the message in the speech and by the power of music and song. I'd encourage you to have a look at the song and make a video of you singing it as a solo! Submit it to us at artistic@seattleartsongsociety.org or post it on our Facebook page, and help us celebrate this upcoming season and our upcoming birthday! Don't be shy - we will all end up singing this at least once this season (or 5 times if you come to all of the performances which I'm sure you will! ).